The downwinders of southern Utah have been deeply affected by cancers linked to nuclear radiation. Allen v. United States was a landmark case for holding the government responsible for negligence during nuclear testing. When deciding where to perform nuclear tests, the Atomic Energy Commission (AEC) looked westward. Southern Nevada was close to the Los Alamos Laboratory where the weapons were designed, near the Four Corners region rich with the uranium they needed, and in the desert with low population density. To avoid Las Vegas, they just needed wait until the wind was blowing north-east. The Nevada Nuclear Testing site was built and tests began. As large clouds loomed, residents of southern Utah were repeatedly assured by the AEC that they were safe from radiation. After several years, residents could not ignore the growing rates of cancer in their community. Leukemia increased over the national average and death occurred twice as often. Newspaper stories, congressional reports, and executive attention in other areas of the country encouraged the people to action. In 1978 and 1979, local leaders led the community in a lawsuit against the federal government that would become Allen v. United States. In 1979, Utah Senator Orrin Hatch held a special town meeting in St. George, Utah to discuss the issue. Locals attended and shared personal stories, including how children interacting with fallout directly. One citizen commented, “You know how little kids love snow. They went out and would eat the snow. They didn’t know it was going to kill them later on.” Gloria Gregerson shared, “We liked to play under the trees and shake this fallout onto our heads and our bodies, thinking that we were playing in the snow. Then I would go home and eat. If my mother caught me as a young child, I would wash my hands; if not, then I would eat with the fallout on my hands.” At the age of seventeen Gloria developed ovarian, stomach, and skin cancer followed by Leukemia. She died at the age of forty-two in 1983. Few citizens escaped having relatives or friends die of cancer. In 1980, a congressional report “The Forgotten Guinea Pigs” would admit the government “failed to give adequate warning to the residents living downwind from the test site regarding the dangers posed by the radioactive fallout emitted during the atmospheric nuclear test operations.” The question that remained was if the government could legally be held responsible for its actions. Allen v. United States was a landmark case with over 1,100 plaintiffs represented under 24 representative claims with Stuart Udall as their attorney. In 1984, Bruce Jenkins ruled in favor of the people by holding the government liable for negligence. The U.S. appealed and in 1987 the Tenth Circuit Court of Appeals overturned his decision. Despite the fact that it was overturned, Allen v. United States is a landmark case because the citizens won and paved the way for compensation in the future. Suit Filed by Fall-out Victims ~ Source: Iron County Record. 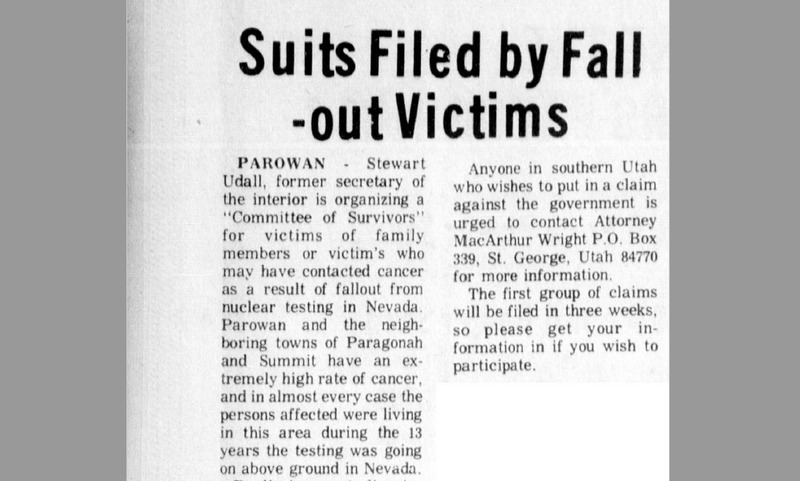 “Suits Filed by Fall-out Victims,” November 2, 1978. Available at https://newspapers.lib.utah.edu/details?id=4498878&q. 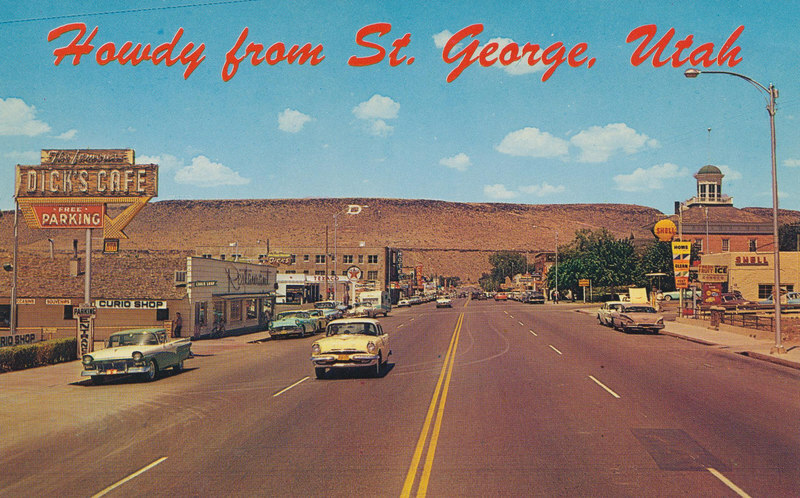 Howdy from St. George, Utah ~ Source: From Flickr. “St. George, Utah,” available at https://www.flickr.com/photos/hollywoodplace/8311834218/in/photolist-dEujJw-9pmFNL-76cXA-7aJ6j2-eaUYRh-dNU1qB-dNZzMj-XbGmav-XwszPU-dfUnEA-df8Azf-JEyMC7-fGtdY4-V1ZgyG-8x1VoX-5Au4Ck-5Au5a4-mSt3Fn-2g1ER8-djHNPi-4ECcXW-TDbXcV-76cWN-TN6rB3-Tbpj4b-SwMakg-TLCpYH-4NhUJc-SzTTsn-TNha2Y-TT9Htr-eZ8Z72-dYHnuq-TDbWUk-Tz9pBj-StSGys-SANd8K-TCc9NY-TS5WGz-SzBp4S-qFaFSZ-g5FxKL-dkACg4-kgRZWe-g5FCwa-b1qZmi-g5FrAU-pFwwjB-kgTLCh-g5GnRe. 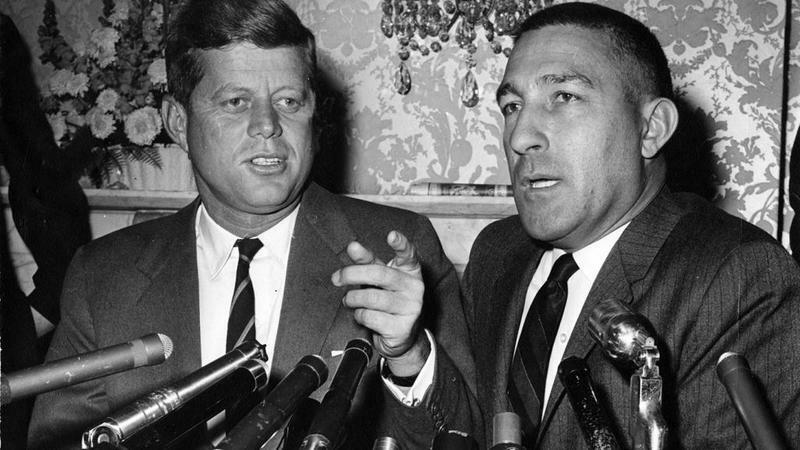 Stewart L. Udall and John F. Kennedy ~ Source: University of Arizona, Tuscon. “Stewart L. Udall Papers,” available at https://speccoll.library.arizona.edu/collections/stewart-l-udall-papers. 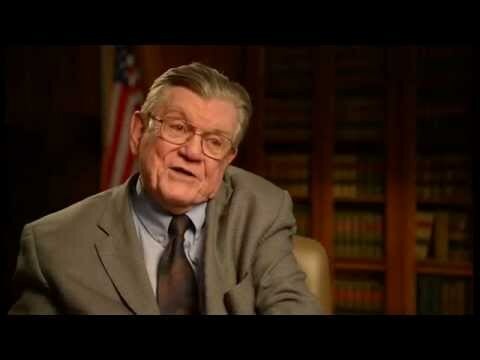 Judge Bruce Jenkins ~ Source: Tenth Circuit Historical Society, from YouTube. “Judge Bruce Jenkins on Allen v. United States,” available at https://m.youtube.com/watch?t=115s&v=6OQDbsFZUKA. Emily Cook, Brigham Young University, “Downwinders in Court: Irene Allen v. United States,” Intermountain Histories, accessed April 20, 2019, https://www.intermountainhistories.org/items/show/165. Ball, Howard. Justice Downwind: America’s Atomic Testing Program in the 1950s, New York: Oxford University Press, 1986. Fox, Sara. Downwind: A People’s History of the Nuclear West, Lincoln: University of Nebraska Press, 2014. Good, Katherine. “Damned Stupid Old Ginea Pigs,” Utah Historical Quarterly (Fall, 2016). Huyghe, Patrick and David Konigsberg. The New York Times. “Grim Legacy of Nuclear Testing," April 22, 1979. 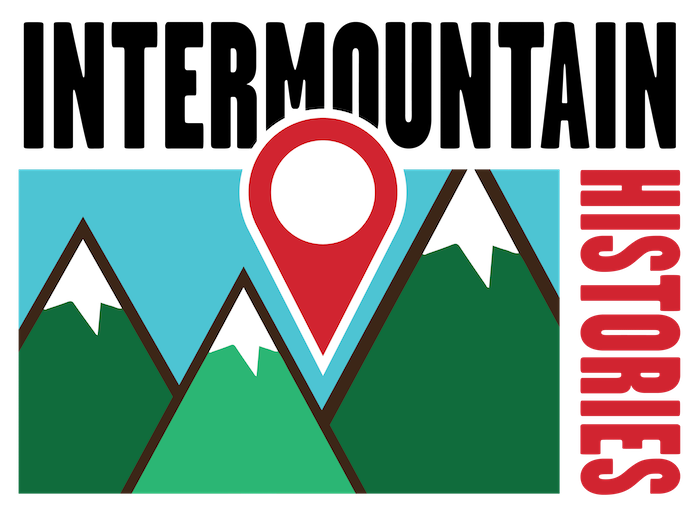 Available at https://search-proquest-com.erl.lib.byu.edu/docview/120902321/294C204900AE4080PQ/1?accountid=4488. The New York Times. “Negligence Ruling on U.S. Atom Tests Overturned,” April 22, 1987. Available at http://www.nytimes.com/1987/04/22/us/negligence-ruling-on-us-atom-tests-overturned.html. Iron County Record. “Suits Filed by Fall-out Victims,” November 2, 1978. Available at https://newspapers.lib.utah.edu/details?id=4498878&q. Tenth Circuit Historical Society. “Judge Bruce Jenkins on Allen v. United States,” avaiilable at https://www.youtube.com/watch?v=6OQDbsFZUKA\. U.S. Congressional Committee Report. “The Forgotten Guinea Pigs,” Washington, 1980.